BCB students wear pink for Breast Cancer Awareness. Bertha C. Boschulte Middle School donated $1,000 to the St. Thomas East End Medical Corporation (STEEMC) on Friday, Oct. 25, which was collected through a breast cancer fundraising activity held at the school. The BCB school family wore pink in support of breast cancer awareness and assembled outside the auditorium to mark the occasion. School Counselor Patricia Adams, who spearheaded the fundraising activity, briefly spoke to students about breast cancer awareness. 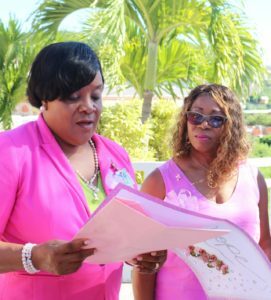 Assistant Principal Dr. Merlene Jones reads card aloud to breast cancer survivor Margarita Charles-Smith. Adams invited Margarita Charles-Smith — a special education teacher and a breast cancer survivor — to share her story. Charles-Smith gave an emotional account of her initial diagnosis and the impact it had on her and her family. She encouraged women and girls to do monthly self-exams and mammograms as directed by their doctors. Following her account, Merlene Jones, Ph.D. and Michelle Wilkinson, BCB assistant principals, presented Charles-Smith with a card signed by her colleagues showing their support. Later in the program, Moleto Smith, director of STEEMC, announced that this year his organization would host the annual Relay for Life event in place of the America Cancer Society, which has discontinued operations in the territory. Relay for Life, he said, is scheduled for January and is a fundraiser to help residents of the V.I. 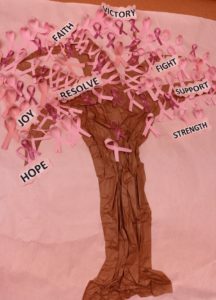 offset breast cancer treatment costs. BCB’s breast cancer awareness fundraiser was also marked by students decorating classroom bulletin boards and doors.